We had similar magnet scale issues at our 1/32 club and eventually just added an allowable 5% variance to keep folk happy - of course they then worked to the upper limit and the complaints filtered back. I did build a gauss meter per the article and indeed fitted it in to the slot on an old plastic Scalextric car case, to give tiny distance to the magnet. Worked a treat for me to grade my own magnets but never got roundtuit on exploring for cars club use. I did find placement ultra, ultra critical but same for the magnet scale, anway. Measuring the relative magnetic downforce of an entire car is somewhat easier than measuring the magnets themselves. Earlier I mentioned that my 1/32nd club used home made testers. We had three tracks at the time and each one had its own permanent tester like this. A reference magnet was used to keep the three in sync. I do not recall if each location had its own calibration standard of if someone brought one along on race night. What are you using to support the glass plate? I do not believe that the thickness of the plate will change with changes in humidity. If the supports are wood humidity could have an effect. The side supports are plastic - they are Lifelike bridge supports. I have them marked as well as to right and left so they always go on the same side. The fact that a shim as thin as .002" increases my readings by about 1+ grams shows how just a small amount of swelling or contraction can alter the readings sometimes by as much as 10%. If all I have to do is check my benchmark magnets and add the shim if the readings are too low makes this an easy fix. It will be interesting to see the next time I get high readings without the shim. I will need to make a note of the weather conditions at the time. If I hadn't already gone through measuring the magnets in all my T-Jets and AFX I could possibly try to find another way to set this up. But I don't want to have to go through that process again. I will have to try as much as possible to mimic the same readings every time I set up the scale. Last edited by Grandcheapskate; 02-22-2019, 09:17 PM. To simplify things somewhat and avoid fussing around with shims, once you have a reference magnet with a value marked on it you can take a new reading after you assemble your rig and use that to calculate a correction factor. If you did a reference magnet plus a bunch of regular magnets at one sitting at the next sitting you could do a reading of your reference magnet first. If it was originally 14.6 grams and now it is only 13.5 grams the correction factor would be 1.0815. If you were to take new readings of the rest of the magnets and multiply those by the correction factor the readings from the two sittings should then match. Today I set up the scale again and this time my 14.6 test magnet only measured 11.5. Adding the .002" shim only brought it up another gram or so. I am going to take everything out of the cold basement and bring them upstairs so they can acclimate overnight and try testing again tomorrow. I will see what effect being much warmer has on the readings. I don't think magnet strength is that critical, yes it helps in certain situations and to much magnet strength can cause problems just as much as to little. I move the probe around the middle of the magnet until I find the highest reading. I can reproduce my readings within a few gauss. It takes a fairly large difference in the reading to make a real difference in performance. When I match magnets I keep them within 10 gauss, If you are talking about motor magnets or downforce you probably need a 100 gauss difference to see a measurable change in performance on the track. Stronger magnets can give you a little more power. 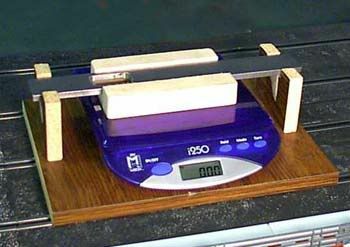 It is possible to use magnets that are too strong, especially with armatures that have a higher ohm value. Even with T-Jet type cars magnetic downforce is a factor, stronger magnets will give you slightly higher cornering speeds, but you might lose a little top speed if the magnets are too strong..
Last edited by RichD; 03-14-2019, 11:51 AM. After taking everything upstairs and letting it sit for a day or two, the readings are still lower than my recorded readings. In fact I cannot get anything to be consistent. For example, if I put a magnet on the scale I might get a reading of 11.5 grams. Moving it around on the plate changes very little. I then take it off the plate, measure a couple other magnets and then retry the first magnet and get a reading sometime a gram or so higher (or lower) than just two minutes before. Drives me crazy.